A new report has found that the Philippines is a worse place for children to grow up than North Korea. 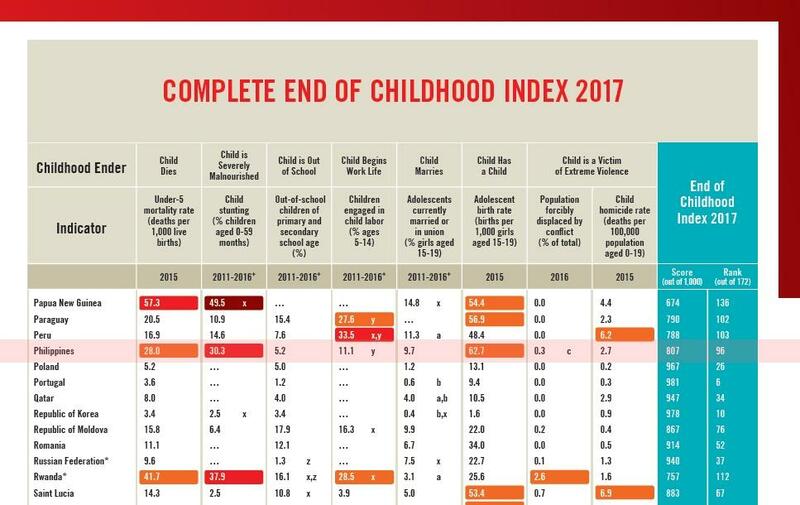 The Philippines ranked 96th out of 172 countries in the End of Childhood 2017 report, released by Save the Children today (Thursday, June 1), which is also International Children’s Day. The country also lags behind Southeast Asian neighbours Vietnam (92), Thailand (84), Malaysia (65), Brunei (64) and Singapore (33). The Democratic People’s Republic of Korea – North Korea – ranked in 78th place. The report ranked the countries by comparing data on childhood mortality, stunting, out-of-school children, early marriage, teenage pregnancy, internal displacement due to conflicts and childhood homicide. The organisation’s health and nutrition advisor Dr Amado Parawan the three indicators all helped cause a “vicious cycle” of a “stolen childhood” for Filipino children. “We found that a lot of malnourished children, when you look at their mothers, they are teenagers. And 50 per cent of child mortality is attributed to malnutrition and wasting. And, of course, it is a vicious cycle,” he said. Of the three indicators, the report said that stunting was the most widespread problem in the Philippines, with about 3.6 million children affected. Mr Olney said the government should allocate more cash for improving nutrition and also support the ‘1,000 days bill’ — which aims to ensure childhood nutrition programmes in every baranguay — in the Senate. “If you think about it,” he said, “increasing the number of productive members of society is great for everyone. “What does it do even for the billionaires of the Philippines to have millions of workers who are under-educated and undernourished and less productive? It doesn’t help them. Rising tide lifts all boats, as we say. The report listed Norway, Slovenia, Finland, Netherlands, Sweden, Portugal, Ireland, Iceland, Italy and Belgium as the top eight places for children to grow up. Tied in 10th place were Belgium, Cyprus, Germany and South Korea. Guinea, Sierra Leone, Burkina Faso, South Sudan, Chad, Somalia, Central African Republic, Mali, Angola and Niger were among the countries at the bottom of the list.